... automatically change background image, add desktop clock or calendar, fade desktop with color gradients and more. Status: Portable. Looks like all settings are saved to SE-DesktopConstructor.exe.Options ... Stealth? No: the program modifies the registry in order to change the desktop (HKU\current\Control Panel\Desktop). ... enables you to quickly and accurately find the right color by its characteristics, create and edit color palettes, use different color swatches for all occasions. It's a real shame because I was starting to really get into the SE-ColorMaker tool, even in the face of a remarkable number of great freeware color tools here on the site. This app is no longer in development. The portable version is stealth imo. SE-ColorMaker has already been reviewed here and discussed here. This is a good program. 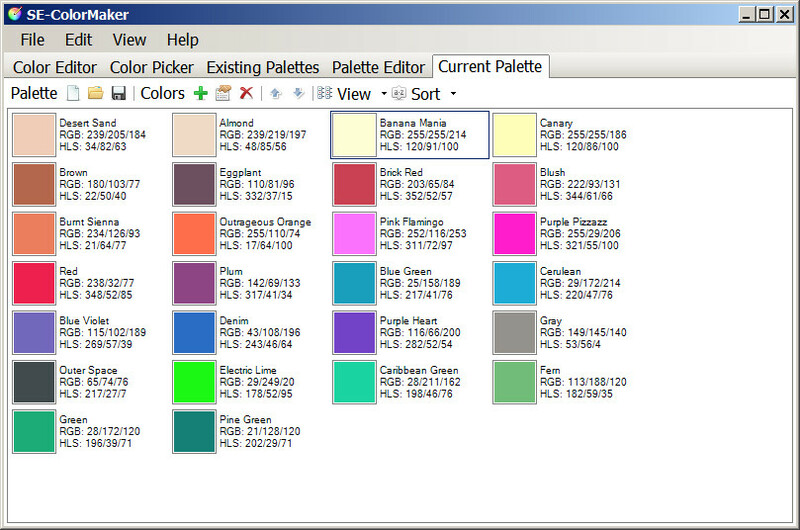 Settings are saved in SE-ColorMaker.exe.Options file inside program folder. Again, sorry for not checking more thoroughly. Will take more care in the future. Don't be sorry, this happens to everyone, including me. Of course the post should not be deleted. Thanks for being lenient about this. and the attachment section at the bottom also lists this jpg only. Somehow or other it must have been taken over from the ColorBug thread. Maybe you don't even see 3 screenshots? I already cleared all my browser caches, but to no avail. Something is wrong either with my system or with the forum attachments. No hurt feelings if you just go ahead and delete these threads. Also, I don't know how long the linked screenshots will stay up on that server. Whatever you want to post about is fine, even if you accidentally go over territory that's been covered before. We're glad to have you. Color tools like the ones you've highlighted have been amazingly useful over the years. Please don't quit talking about programs you like, even if they're not portable. I can sort out whatever "correct forum" thing later. I'll take a look at the post you're having issues with. Actually if there's a problem with the forum, I'm even *more* inclined to keep the thread around to help find an issue. We went through a conversion a few months ago and are still shaking out the bugs. Maybe you don't even see 3 screenshots? The 3 screenshots show up just fine on my side. Thank you. However, now it is the second screenshot that does not belong into this thread. When you hover the mouse over the jpg, the name indicates whether a particular screenshot belongs to ColorMaker vs ColorBug. If you are experiencing problems with ImgBB you may try imgbox- with registered account images can be organized into galleries. By the way the forum allows only 3 attachments per post. When you edit your post don't you see "Delete file" button? It deletes the already attached files. When you edit your post don't you see "Delete file" button? Just for one image only: ColorMaker_004.jpg. No other images are listed, Although the post still shows 3 pics, one of them belonging to ColorBug, not ColorMaker. First, I had a look at your ImgBB links, they are embeddable. To get the actual address of the image file depending on your browser right-click on the image and either choose "View Image" command or "Copy image address" command or "Open image in new tab" command and then copy the URL. Example- the image link of https://ibb.co/ksinqd is https://image.ibb.co/ifXQbJ/Color_Maker_001.jpg. Once you have the actual address of the image file just paste it, select it and use "Insert image" button from the toolbar. This is enough for embedding images. About the attachments- I do not know what to say. Perhaps you may ask the administrators. You may just use "Delete file" button and embed the images using direct image links plus "Insert image" command from the toolbar. Something is definitely wrong here, either on my side (latest Firefox + Win7) or with my forum account/ attachment settings. I am busy these days. Will check back next weekend. Yeah that's a concern. I'll drop a line to Andrew. Please tell me whether my line of testing is correct. I replied to this topic, added 3 images as attachment, placed all of them inline, then click [Submit]. All the images seem to appear correctly. However, when I tried to edit my post, only the first attachment is present, and when I made minor mods to the post and click [Submit], it says the other 2 attachments are missing. Is that a good description of the problem at hand? [EDIT] This appears to be a known bug, which I have fixed.